At Bigleaf, we’re always striving to make our Cloud-first SD-WAN even easier to integrate into every customer network. To that end, we’ve heard from partners and customers asking for the ability to configure a second LAN port on our edge routers. Until now, Bigleaf customers with multiple edge or WAN devices would have employed an additional switch to connect to the Bigleaf edge router. That’s why we’re excited to announce that Bigleaf customers can now configure the AUX port on the Bigleaf edge router as a second LAN port. This is a big deal for customers using a second edge router or firewall. For example, those using an IAD for SIP termination, or those who segment their corporate network with a separate firewall from their guest network. With the second LAN port, customers who need to connect two devices can benefit from Bigleaf’s improved internet and application performance without any additional equipment. This new feature enables users to configure the AUX port on our edge routers to be bridged together with the LAN port, giving them the ability to plug two network devices in that can both use our service at the same time. They can use one public IP address block across both ports (assuming they have more than one usable LAN network IP), or two separate IP address blocks. Once configured, this feature allows Bigleaf users to connect both a data firewall and a VoIP network termination device such as another firewall or router to our service without a switch in-between. Using the second LAN port can be done using your existing edge router. 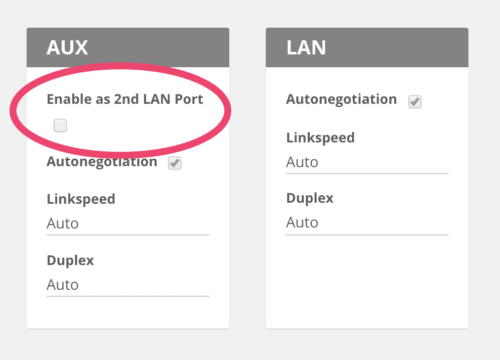 The second LAN port is enabled in your Bigleaf web dashboard by simply checking the “Enable as 2nd LAN Port” box on the config tab. When the feature is enabled, the web dashboard “overall” graph will be automatically updated to show the usage across both the LAN and AUX ports. If you have our High-Availability upgrade option, you already have the ability to use multiple LAN ports. Please refer to the setup guide included with the equipment, or contact our support team for help. For customers hoping to enable this feature, we currently limit the ability to edit config within the web dashboard to Bigleaf support teams only. This will be changing in the near future with an expanded role/permissions system, but for now, please contact support to have this enabled.